I picked up this Olympus microcassette recorder from Staples for 35 bucks. Why? It’s a quick way for me to record an idea or something I need to remember to do. My cell phone has a voice recorder but it allows only 10 notes. There’s also a voice recorder on my PDA, but I need to enter a password then navigate some menus to get at it. I also have pen and paper in my wallet, but it’s faster to speak than to write. So whether I’m sitting in the car, or taking a shower, or walking along the street, I can quickly take this out and press Record when I need to note an idea for later. Of course, it’s sometimes not appropriate to pull out a tape recorder, such as when you’re having a conversation with someone, in which case you use pen and paper. But it’s pretty handy for most situations (not to mention cheap). I transfer these voice notes to my main system (Outlook) every few days, or during my GTD Weekly Review on Saturdays. posted by Jonathan at 1/02/2010 03:11:00 p.m.
You couldn't find one that is solid state rather than mechanical? I made the mistake of buying a solid state recorder (not waterproof) not realizing it didn't sync to a computer (who would have thought?). By Doug Ransom, at 1/03/2010 9:33 a.m. The solid state ones were a bit more expensive, so I decided to go with this one. 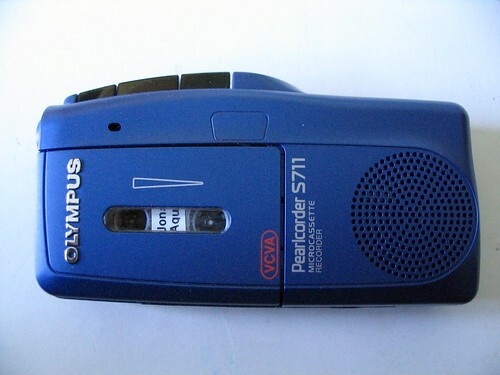 Also, I had an Olympus microcassette recorder in the past, and found it to work well. What do you like about the solid state ones? By Jonathan, at 1/03/2010 10:42 a.m.
No moving parts - i would presume its more reliable and compact! And small. But it frustrates me I can't sync it to my computer. I don't think I'd take it into the shower tho. By Doug Ransom, at 1/03/2010 11:26 a.m.
Whatever happened to a pen and a notebook? Just sayin'. By Anonymous, at 5/05/2010 11:24 p.m.